In December, a result from the Large Underground Xenon (LUX) experiment was featured in Nature’s Year In Review as one of the most important scientific results of 2013. As a student who has spent the past four years working on this experiment I will do my best to provide an introduction to this experiment and hopefully answer the question: why all the hype over what turned out to be a null result? The LUX detector, deployed into its water tank shield 4850 feet underground. Weakly Interacting Massive Particles (WIMPs), or particles that interact only through the weak nuclear force and gravity, are a particularly compelling solution to the dark matter problem because they arise naturally in many extensions to the Standard Model. Quantum Diaries did a wonderful series last summer on dark matter, located here, so I won’t get into too many details about dark matter or the WIMP “miracle”, but I would however like to spend a bit of time talking about direct dark matter detection. The Earth experiences a dark matter “wind”, or flux of dark matter passing through it, due to our motion through the dark matter halo of our galaxy. Using standard models for the density and velocity distribution of the dark matter halo, we can calculate that there are nearly 1 billion WIMPs per square meter per second passing through the Earth. In order to match observed relic abundances in the universe, we expect these WIMPs to have a small yet measurable interaction cross-section with ordinary nuclei. In other words, there must be a small-but-finite probability of an incoming WIMP scattering off a target in a laboratory in such a way that we can detect it. 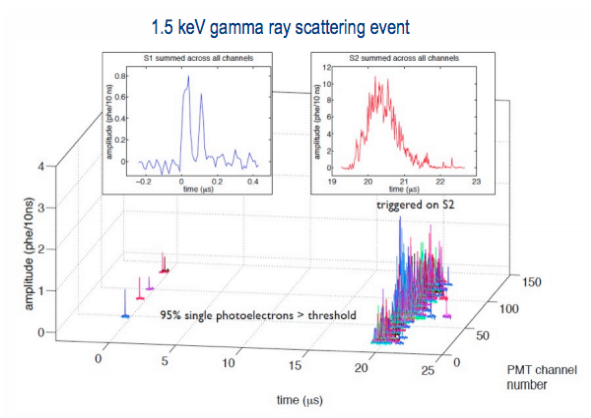 The goal of direct detection experiments is therefore to look for these scattering events. These events are characterized by recoil energies of a few to tens of keV, which is quite small, but it is large enough to produce an observable signal. So here’s the challenge: How do you build an experiment that can measure an extremely small, extremely rare signal with very high precision amid large amounts of background? The signal from a recoil event inside a direct detection target typically takes one of three forms: scintillation light, ionization of an atom inside the target, or heat energy (phonons). Most direct detection experiments focus on one (or two) of these channels. Xenon is a natural choice for a direct detection medium because it is easy to read out signals from two of these channels. 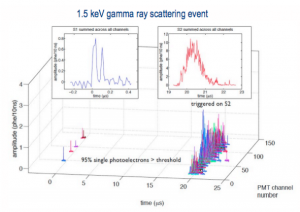 Energy deposited in the scintillation channel is easily detectable because xenon is transparent to its own characteristic 175-nm scintillation. Energy deposited in the ionization channel is likewise easily detectable, since ionization electrons under the influence of an applied electric field can drift through xenon for distances up to several meters. These electrons can then be read out by any one of a couple different charge readout schemes. Furthermore, the ratio of the energy deposited in these two channels is a powerful tool for discriminating between nuclear recoils such as WIMPs and neutrons, which are our signal of interest, and electronic recoils such as gamma rays, which are a major source of background. 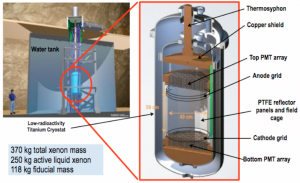 Xenon is also particularly good for low-background science because of its self-shielding properties. That is, because liquid xenon is so dense, gammas and neutrons tend to attenuate within just a few cm of entering the target. Any particle that does happen to be energetic enough to reach the center of the target has a high probability of undergoing multiple scatters, which are easy to pick out and reject in software. This makes xenon ideal not just for dark matter searches, but also for other rare event searches such as neutrinoless double-beta decay. The LUX experiment is located nearly a mile underground at the Sanford Underground Research Facility (SURF) in Lead, South Dakota. LUX rests on the 4850-foot level of the old Homestake gold mine, which was turned into a dedicated science facility in 2006. Besides being a mining town and a center of Old West culture (The neighboring town, Deadwood, is famed as the location where Wild Bill Hickok met his demise in a poker game), Lead has a long legacy of physics. The same cavern where LUX resides once held Ray Davis’s famous solar neutrino experiment, which provided some of the first evidence for neutrino flavor oscillations and later won him the Nobel Prize. A schematic of the LUX detector. The detector itself is what is called a two-phase time projection chamber (TPC). It essentially consists of a 370-kg xenon target in a large titanium can. This xenon is cooled down to its condensation point (~165 K), so that the bulk of the xenon target is liquid, and there is a thin layer of gaseous xenon on top. 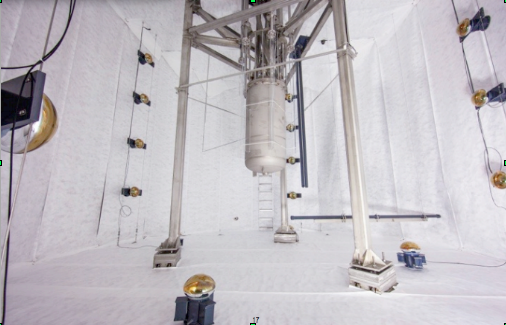 LUX has 122 photomultiplier tubes (PMTs) in two different arrays, one array on the bottom looking up into the main volume of the detector, and one array on the top looking down. Just inside those arrays are a set of parallel wire grids that supply an electric field throughout the detector. A gate grid located between the cathode and anode grid that lies close to the liquid surface allows the electric field in the liquid and gas regions to be separately tunable. When an incident particle interacts with a xenon atom inside the target, it excites or ionizes the atom. In a mechanism common to all noble elements, that atom will briefly bond with another nearby xenon atom. The subsequent decay of this “dimer” back into its two constituent atoms causes a photon to be emitted in the UV. In LUX, this flash of scintillation light, called primary scintillation light or S1, is immediately detected by the PMTs. Next, any ionization charge that is produced is drifted upwards by a strong electric field (~200 V/cm) before it can recombine. This charge cloud, once it reaches the liquid surface, is pulled into the gas phase and accelerated very rapidly by an even stronger electric field (several kV/cm), causing a secondary flash of scintillation called S2, which is also detected by the PMTs. A typical signal read out from an event in LUX therefore consists of a PMT trace with two tell-tale pulses. A typical event in LUX. The bottom plot shows the primary (S1) and secondary (S2) signals from each of the individual PMTs. The top two plots show the total size of the S1 and the S2 pulses. As in any rare event search, controlling the backgrounds is of utmost importance. LUX employs a number of techniques to do so. By situating the detector nearly a mile underground, we reduce cosmic muon flux by a factor of 107. Next, LUX is deployed into a 300-tonne water tank, which reduces gamma backgrounds by another factor of 107 and neutrons by a factor of between 103 and 109, depending on their energy. Third, by carefully choosing a fiducial volume in the center of the detector, i.e., by cutting out events that happen near the edge of the target, we can reduce background by another factor of 104. And finally, electronic recoils produce much more ionization than do the nuclear recoils that we are interested in, so by looking at the ratio S2/S1 we can achieve over 99% discrimination between gammas and potential WIMPs. All this taken into account, the estimated background for LUX is less than 1 WIMP-like event throughout 300 days of running, making it essentially a zero-background experiment. The center of LUX is in fact the quietest place in the world, radioactively speaking. From April to August 2013, LUX ran continuously, collecting 85.3 livedays of WIMP search data with a 118-kg fiducial mass, resulting in over ten thousand kg-days of data. A total of 83 million events were collected. Of these, only 6.5 million were single scatter events. After applying fiducial cuts and cutting on the energy region of interest, only 160 events were left. All of these 160 events were consistent with electronic recoils. Not a single WIMP was seen – the WIMP remains as elusive as the unicorn that has become the unofficial LUX mascot. So why is this exciting? The LUX limit is the lowest yet – it represents a factor of 2-3 increase in sensitivity over the previous best limit at high WIMP masses, and it is over 20 times more sensitive than the next best limit for low-mass WIMPs. The 90% confidence upper limit on the spin independent WIMP-nucleon interaction cross section: LUX compared to previous experiments. Over the past few years, experiments such as DAMA/LIBRA, CoGeNT, CRESST, and CDMS-II Si have each reported signals that are consistent with WIMPs of mass 5-10 GeV/c2. This is in direct conflict with the null results from ZEPLIN, COUPP, and XENON100, to name a few, and was the source of a fair amount of controversy in the direct detection community. The LUX result was able to fairly definitively close the door on this question. If the low-mass WIMPs favored by DAMA/LIBRA, CoGeNT, CRESST, and CDMS-II Si do indeed exist, then statistically speaking LUX should have seen 1500 of them! Despite the conclusion of the 85-day science run, work on LUX carries on. Just recently, there was a LUX talk presenting results from a calibration using low-mass neutrons as a proxy for WIMPs interacting within the detector, confirming the initial results from last autumn. Currently, LUX is gearing up for its next run, with the ultimate goal of collecting 300 livedays of WIMP-search data, which will extend the 2013 limit by a factor of five. And finally, a new detector called LZ is in the design stages, with a mass twenty times that of LUX and a sensitivity far greater.